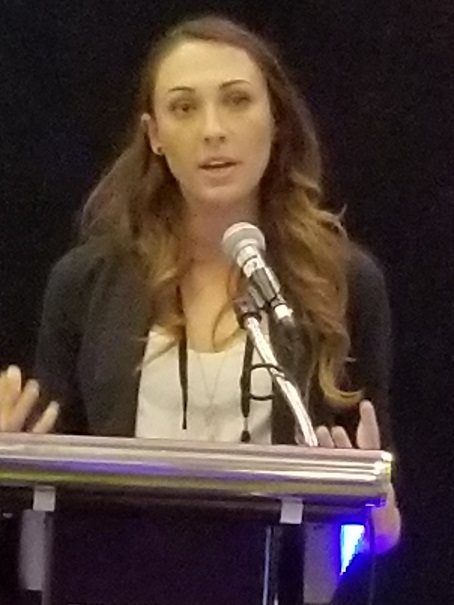 Rachael Zemek from the University of Western Australia in Australia presents her team’s abstract to a group at iMig 2018 in Ottawa, Canada. Much recent research on how to stop a mesothelioma tumor, as well as other types of cancer with poor prognoses, has focused on immunotherapy. At present, mesothelioma immunotherapy treatments only help a small number of patients. But the result for those patients is so remarkable that scientists are scrambling to understand how to harness the power of immunotherapy to help more mesothelioma patients. A study that generated excitement at the 14th International Conference of the International Mesothelioma Group (iMig) looked at why one mesothelioma tumor will respond to immunotherapy treatment and another won’t. The answer to this question could provide a blueprint for pre-treatment to improve the effectiveness of mesothelioma immunotherapy. A group of researchers led by Rachael Zemek from the University of Western Australia in Australia gave themselves an ambitious goal: create a controlled environment to grow cancerous tumors in a line of mice that are genetically identical. They needed this control because they wanted to explore whether differences in the microenvironment around a mesothelioma tumor affected its response to a checkpoint blocking immunotherapy drug. They had to rule out other differences in the mice and the tumors to isolate the key biomarkers. The study is very technical; here are some definitions to help you understand it. Checkpoint blocker: Your immune system is capable of killing off damaged and diseased cells, including cancer cells. A complex environment of proteins regulates your immune system. Cancerous tumors manipulate these proteins to avoid a lethal response from your immune system. Mutations can alter immune pathways and allow a mesothelioma tumor to grow freely because it is invisible to the immune system. Immunotherapy drugs that overcome this cancer mechanism are called checkpoint blockers. The general term for this immunotherapy technique is immune checkpoint blockade (ICPB). PD-L1: PD-L1 stands for programmed death ligand 1. PD-L1 is a protein that, when it is doing its job correctly, turns down your immune system at times when your normal immune response would cause harm. PD-L1 is the reason that a pregnant mother’s immune system doesn’t attack her fetus as a foreign body. Some cancer cells have evolved a mechanism to increase the amount of PD-L1, thus turning away the killer T cells that would normally find and kill them. PD-1: Programmed cell death protein or PD-1 tones down immune response to keep inflammation in check and prevent autoimmune responses (where your immune system believes your healthy cells are diseased and attacks them). As the name suggests, PD-1 also promotes the cycle of cell death that is necessary to our health. PD-1 is overexpressed in some cancerous tumors, causing the immune system to stand down when it should be on guard against dangerous cancer cells. CTLA4: Shorthand for cluster of differentiation 152, CTLA4 is a segment of a T cell that bonds with proteins that suppress immune response. Cancerous cells sometimes cause an overabundance of CTLA4, thus reducing your immune response to the cancer. The researchers used ICPB treatments that target the PD-L1, PD-1, and CTLA4 pathways. They looked deep into the microenvironment around the mesothelioma tumor to find biomarkers associated with how each tumor responded to mesothelioma treatment. If this research opens the door to more effective immunotherapy, it’s hard to overstate its importance. Like all avenues of scientific inquiry, however, the outcome is uncertain. Even if this study doesn’t lead to mesothelioma immunotherapy pre-treatment, it’s certain that other researchers are asking similar questions, and someone will find an answer – though perhaps not as quickly as mesothelioma families would like. You may have heard stories about a few mesothelioma patients who have had amazing success with checkpoint blocking immunotherapy drugs like Keytruda. There are cases where a patient’s mesothelioma tumor has shrunk to the point where the cancer has gone into remission. This is unprecedented for mesothelioma and it has, rightly, generated a lot of excitement in the mesothelioma community. The problem is that, for many mesothelioma patients, immunotherapy drugs are either not very effective or not at all effective. While the treatment uses the power of your own immune system and can be less harsh than chemotherapy drugs, some people experience very unpleasant side effects when the drugs send their immune systems into overdrive. The question that no one yet knows the answer to is why a few patients respond so well to immunotherapy drugs while others aren’t helped at all. The answer isn’t necessarily to match immunotherapy treatments to the precise gene mutations that they target; there have been surprising recoveries in some patients without those mutations. The research presented by the Australian team at iMig represents an innovative approach to this problem. If they successfully identify biomarkers in the microenvironment around the mesothelioma tumor that predict whether a tumor will respond to checkpoint blocking immunotherapy drugs, their study will pave the way for more effective immunotherapy. Is this the Next Mesothelioma Breakthrough? This study of the mesothelioma tumor microenvironment could have a big impact on mesothelioma treatment. The Australian researchers were able to identify differences in the mouse tumors, even though the tumors had all been generated from the same cell line. The scientists were able to divide the tumor microenvironment into two distinct categories. The tumors that responded to checkpoint blockers all fell into one category; the tumors that didn’t respond all fell into the other. They reported that their result matches data from human patients who have been treated with antibodies to PD-1. After identifying the biomarkers for responsiveness, the researchers were able to use drugs to turn on the helpful genes. This led to a better response to immunotherapy in the mouse tumors. The Australian study found a gene signature that led to positive response to immunotherapy treatment. This can potentially be used to understand which mesothelioma patients are most likely to benefit from these treatments. It could also lead to the development of a two-part treatment: first, alter the microenvironment to be more receptive, then administer immunotherapy. The iMig conference is held every two years. Each time, several studies are singled out for the Young Investigator Award. The Australian research team received one of these awards at the 2018 conference for their exciting study in mice. The Young Investigator Awards help promising young scientists advance their careers and their research. The awards recognize the contributions made by new scientists who may be just entering the field of mesothelioma research. Kazan Law, the law firm that sponsors the Mesothelioma Circle blog, also sponsors the iMig Young Investigator Awards. Support of scientists and of the iMig conference is a key part of the firm’s continuing commitment to serve mesothelioma patients and their families. Until there is a cure, the fight for better mesothelioma outcomes continues.